Awe inspiring. Immense. Unparalleled. These are words often used to describe the collection of dinosaur fossils at the American Museum of Natural History in New York City. A recent $48 million renovation incorporated the use of natural light and created six new halls to house the museum's impressive fossil collection, which tells the story of vertebrate evolution. 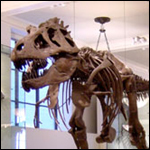 Tyrannosaurus, Apatosaurus, and Barosaurus are just a few of the dinosaur stars at the museum. There's also the world's only intact Velociraptor skull, a mummified Hadrosaurus and an Oviraptor egg with the fetus clearly visible. Of the more than 600 major specimens, almost 85% are genuine dinosaur skeletons, as opposed to plaster models favored by many museums. Visitors will have a hard time seeing every nook and cranny of the museum's wide array of impressive exhibits. Allow multiple days to visit if you plan to see everything this museum offers. With more than 35 complete dinosaur skeletons and 800 fossils, the Royal Tyrrell Museum has one of the most impressive dinosaur collections in the world. 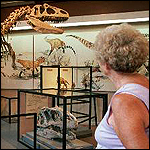 The modern museum has glass-free displays that allow visitors to get up close and personal with the dinosaur models and skeletons. The "Extreme Theropods" exhibit is an attention-getter, displaying a group of some of the more ferocious meat-eating dinosaurs ready to pounce. Many of the dinosaurs on display were found in the nearby Dinosaur Provincial Park. The museum offers amateur paleontologists the chance to try a hands-on excavation tour. Self-guided walking trails into the badlands surrounding the museum are also available. 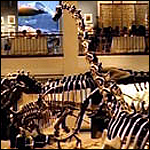 The Smithsonian's National Museum of Natural History is one of the leaders in dinosaur research. Seven of the 45 dinosaurs in residence are the original fossil specimens used to name new species. The museum has the only examples on public display in the world of Ceratosaurus, a horned carnivore from the late Jurassic period, as well as Aceratosaurus, a predatory dinosaur. It also has the most complete Allosaurus skeleton on exhibit. 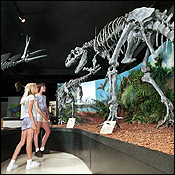 In addition to all the dino-fun, the National Museum of Natural History sits in a prime location on the National Mall and is in walking distance to some of Washington D.C.'s most popular attractions, such as the Washington Monument and other Smithsonian museums. Stegosaurus and Brontosaurus are names familiar even to those who are not avid dinosaur fans. These dinosaurs were two of the most famous finds by Othniel Charles Marsh, who spent a lifetime building the collection of fossils at the Peabody Museum. His wealthy uncle, philanthropist George Peabody, for whom the museum is named, financed his research efforts and the building of the museum at Yale University. In addition to the extensive collection of towering dinosaurs, the museum also houses the Pulitzer Prize-winning mural, "The Age of Reptiles." The 110-foot painting by Rudolph F. Zallinger depicts 300 million years of Earth's history. Philanthropist Andrew Carnegie was one of the original dinosaur fans. He funded many dinosaur expeditions, including one in Utah that netted many of the fossils now housed in the Carnegie Museum. The dig site is now part of the Dinosaur National Monument. 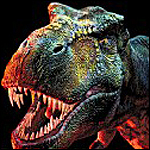 In addition to the impressive Tyrannosaurus, the museum also displays two huge herbivores, Diplodocus and Apatosaurus. The latter dinosaur is better known by its more common name, Brontosaurus. Children will enjoy seeing a life-sized version of Stegosaurus, a dinosaur often reproduced in toy-sized plastic, distinguishable by the row of triangular bony plates along its back. Overall, the Carnegie Museum of Natural History has more than 500 specimens from 28 different species. It has one of the largest collections of dinosaur bones in the United States and the best collection of long-necked and tailed sauropods.